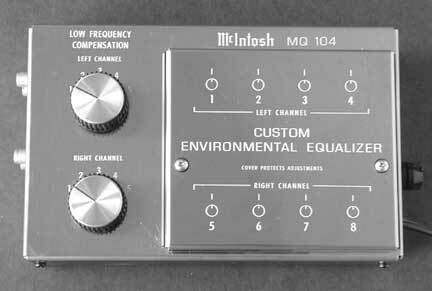 The MQ104 Custom Environmental Equalizer provides the same basic low frequency compensation controls as the MQ101 and MQ102. The individual controls can be seen at the left portion of the MQ104. These 5 positions not only provide correct compensation for the overdamped woofer but also correct for the solid angle where the woofer radiates into the room. The response at the speaker is then flat right down to 20Hz. This compensation is required for all of the ML systems plus the XR3, XR5, XR6, XR7 and XR14 systems. However, this compensation does not correct for room resonances. The MQ104 goes a step further. It has four adjustable filters in each channel. These filters can be tuned to greatly reduce the effect of room resonances from 20Hz up to 1kHz. The response can be adjusted to have lower output at frequencies where there is a corresponding acoustic peak and increased output at frequencies where there is a dip. The resulting acoustic response at the listening position is then smoothed out. Low frequency compensation can be used along with the filters to achieve this. The filters are programmable to be 1/3 octave or 1 octave wide. They and can each boost or cut 12dB in the narrow mode or 15dB in the wide mode. The picture at the right shows the top cover removed. The center frequencies and filter width can be programmed by plugging in two capacitors for each filter. A Frequency Programming Table (shown further down on this page) is provided to select 1/3 octave or octave center frequencies from 20Hz to 1kHz. From the table, the required capacitor values for A and B can be found. 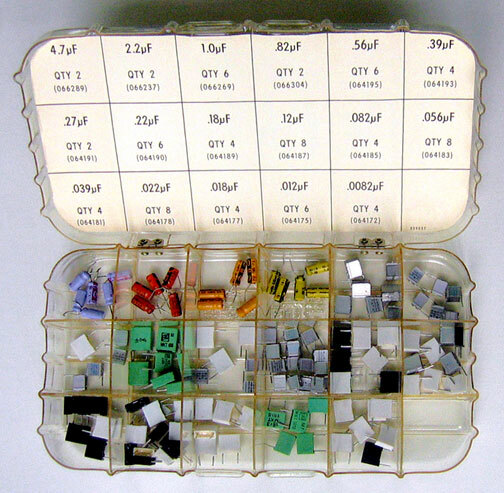 A compartment box with capacitors is provided with each MQ104. Each filter has a control with a center detent that can be adjusted for the amplitude of the boost or cut. The center position is electrically flat. Three holes are available for each capacitor. Only two holes are actually used depending on the lead spacing of the capacitors. Several record sheets are provided that fit under the top cover. The frequencies and capacitor values can be recorded there for each filter. As in the earlier equalizers, the MQ104 is inserted between the preamplifier and power amplifier. 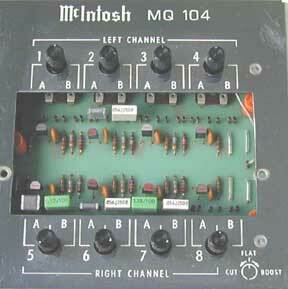 A switch is on the side of the MQ104 so that the filter section can be switched in or out for comparison purposes. After the response is adjusted, the cover can be fastened in place and the unit put out of the way behind other equipment. Later McIntosh systems that no longer use overdamped woofers, and do not require the low frequency compensation, can still be taken a step further with the MQ104. The MQ104 can also be used with other brands of systems as well, but the low frequency compensation switches should be set at the electrically flat position 1. Low frequency compensation is not recommended for other brands of systems because the bass boost may overdrive other woofers that are not designed for this kind of use. Also, when using other brands of woofers with the MQ104 filters in the boost mode, it means that the speaker will be driven with more power in that frequency band or bands. This is not a problem for the McIntosh speakers that are designed to handle high power. The exception for all systems is the vented type of design. At 20Hz, and perhaps higher frequencies, the port or passive radiator is usually completely out of phase with the driving cone resulting in complete cancellation. No amount of boost can compensate for these conditions. There is also the possibility of overdriving an amplifier that does not have Power Guard. If the MQ104 is used with another brand of loudspeaker and/or an amplifier that doesn't have Power Guard, the boost mode is to be used sparingly or not at all. Although the procedure for adjusting the filters is relatively simple, the MQ104 CANNOT be utilized to its fullest potential by using music or other program material as a test signal. Measurement is absolutely necessary to establish the exact frequencies and amplitudes that are a problem so the MQ104 can be correctly tuned. A 1/3 octave analyzer is needed. The tape monitor feature used in the MQ101 and MQ102 is not used in the MQ104 or later equalizers. Additional capacitors are available from your radio parts dealer. Please note that "stock" values are normally the only ones available. If, for example, you calculate a capacitor value of .095 mfd, the closest value available will be .1 mfd. Preferred capacitors are metalized polyester or equivalent for values up to .56 mfd. Capacitors must have a voltage rating of 50V or higher. Sidney Corderman and I visit Hewlett-Packard in California to learn about their 8050A real time analyzer that has a small crt display of 1/3 octave bands. It sells for about $3000. We are considering purchasing a quantity of these so that dealers can use them to equalize customer rooms along with the MQ104. It had only class I filters, however, and the overlap between bands is very significant. Also, it only covers the range from 40Hz to 16kHz and we need measurement down to 20Hz. Management decides not to use this but, instead, creates a McIntosh product. 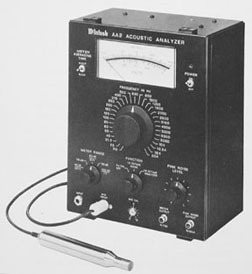 It is the beginning of the McIntosh AA2 analyzer. 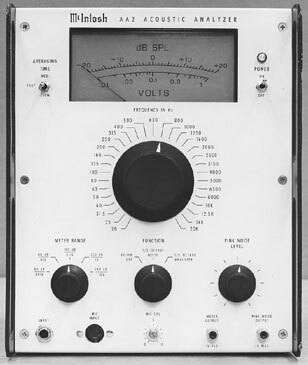 The first prototype (shown in black & white) has a light gray panel and a blue meter. Later, the panel is changed to black and the meter is white. The meter averaging time switch is located at the upper left. Originally, There are 3 averaging times: slow, medium and fast. The switch is changed to slow or fast when the AA2 goes into production. The power switch is at the upper right and above it is a red LED power indicator. The upper meter scale is linear in dB and has a range of –20dB to +20dB. The scale at the bottom is in volts. In the center is the 3-position Function switch having positions of Filter Off, 1/3 Octave Noise or 1/3 Octave Analyzer. At the right is the Pink Noise Level control. At the bottom left is the Input for line level, Microphone Input, Microphone Calibrate, Meter Output (1V at full scale deflection), and the Pink Noise Output (1V maximum). The prototype has no cover. In production, a deep metal cover holds the microphone and 10 foot cord. The cover is held in place with four plastic snap latches. Due to the high peak capability of random noise sources, a limiter is used to eliminate peaks that could otherwise overdrive equipment in the system under test. This limiter in no way affects the measurements. Pink noise is filtered white noise. White noise has constant energy per cycle and has the same spectrum as FM interstation hiss before the de-emphasis network in an FM tuner. By passing the white noise through a filter of minus 3dB per octave, pink noise is created. This has constant energy per octave and correlates much better with musical energy as well as how we hear. Because a constant percent bandwidth is a characteristic of 1/3 octave filters, the actual bandwidth increases with frequency. For accurate meter readings, the product of the bandwidth and the averaging time must be constant. The low frequencies therefore must have a longer averaging time. The slow switch position is used for frequencies from 20 to 160Hz. A short averaging time can be used for frequencies from 200 to 20kHz. An AA2 Owner’s Manual can be found on a separate page. Output Level: 0 to 1 volt RMS into 10k ohms or higher. Output is peak limited for all settings of the level control. When the sound pressure moves the diaphragm closer to the plate, the charge across the condenser increases and there is an analogous increase in voltage. When it moves away, the charge decreases and the voltage decreases. This changing voltage can then be amplified. An electret microphone is a slightly different type of condenser microphone that has a diaphragm made of a charged plastic material tightly stretched over a circular ring. The charge is permanent. The advantage of the electret cartridge is that it needs no polarizing voltage between the diaphragm and the rigid back plate. The charged plastic diaphragm will produce voltage changes between itself and the closely spaced plate behind it as sound strikes the diaphragm. A microphone of this type is less expensive. However it is more susceptible to damage from the environment and cannot be restored. If the diaphragm stretches for any reason, that’s the end of it. Either type of microphone is electrically nothing more than a very small capacitor. It is not practical to run shielded cables from the cartridge to the analyzer. The cable capacity is much higher and forms a voltage divider making the electrical circuit look like two capacitors in series. The resulting output voltage is so low that amplifier noise then becomes a serious problem. For these types of microphone, a preamplifier (impedance converter) is normally built onto the microphone handle directly behind the cartridge. It converts the high impedance of the condenser element to low impedance so that long cables can be run to the remaining equipment. The Electret microphone can be operated using only a small battery in the handle for the preamp. 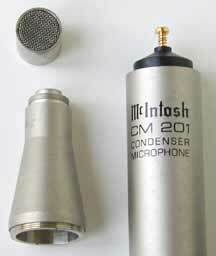 However, the metal diaphragm condenser microphone often has an external power supply. It supplies two voltages; one for the polarizing voltage and one for the preamplifier. 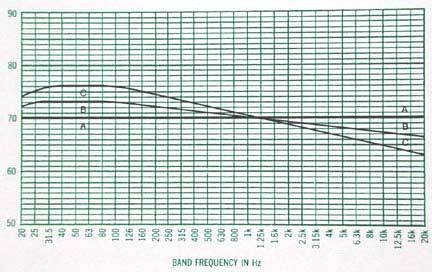 The gain of the preamplifier is usually slightly less than unity. The CM201 uses an FET source follower to provide the very high input impedance that is required. A metal diaphragm cartridge is selected for reliability and ruggedness. An omnidirectional response is required. Directional condenser microphones utilize rear venting that affects the smoothness of response at the low frequencies and is undesirable as an instrumentation microphone. A smaller diameter microphone has lower moving mass and goes out to a higher frequency. The MC201 cartridge outside diameter is ½”. A negligible surface around the microphone is essential to avoid pressure buildup at the diaphragm that can affect the response at high frequencies. The main part of the handle must have a larger diameter to accommodate the preamp printed circuit board. A tapered section is used in between the ½” microphone cartridge and the 13/16” diameter” handle to eliminate pressure buildup. A long pin is used in the center of the tapered section to electrically connect the main handle and the microphone cartridge. The connection in the main handle is spring-loaded and pushes the pin against the contact in the microphone cartridge. This allows the sections to be unscrewed without having a wire that can twist and break. All of the contacts are gold plated so that good electrical contact is assured. Diaphragm resonance is kept very high and internal cartridge acoustic resistance damping helps to keep the Q reasonably low. Typically it has a peak of about 3dB at 15kHz at zero degrees incidence. An individual calibration curve is supplied with each microphone. Because each microphone cartridge has a slightly different sensitivity, a calibration control in the McIntosh AA2 analyzer is factory set to compensate for each cartridge. 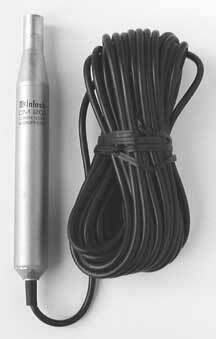 A ten foot shielded cable is supplied with the microphone. It supplies the voltages and is shielded for the microphone output. This same microphone design was later used by Nakamichi for their tape recorders. In the AA2 manual, two different kinds of response characteristics are shown. Typical free field response curves are provided at 0, 30, 60 and 90 degrees incidence. In addition, a random incidence response is provided. It shows that the random incidence response is the same as the free field response below 3000Hz. Typical practice for random noise testing of loudspeakers involves feeding broadband pink noise through an amplifier system to the speaker. This is normally done one channel at a time. The microphone picks up the sound and is fed to 1/3 octave filters and the output of each band is then read on the meter. The readings can be marked down on a pad of chart paper that is supplied with the AA2 analyzer. Gordon Gow found that making measurements in a customer's home with broadband pink noise could be very loud and disturbing, even at a 1 or 2 watt level. The initial AA2 design was modified to include an added capability of narrow band noise measurement. In the 1/3 octave switch position, one frequency selectable 1/3 octave filter is switched to the pink noise output. This provides 1/3-octave bands of pink noise to drive the speaker. A second 1/3-octave filter is switched to the AA2 microphone input. This forms an analyzer section. The frequency control is used to select the particular frequency band of interest and is common to both pink noise output and AA2 input circuits. The two filters track each other accurately. This greatly reduces the sound level in the home. The filter at the microphone input is still needed to reduce background noise from furnaces, air conditioners, etc. that could otherwise interfere with the measurements at all frequencies. Several hours are usually spent in a customer home for the measurements. Sometimes the customer participates and helps to write down the readings for each frequency band. Gordon Gow feels the time is well spent because it sometimes results in the sale of other equipment as well. Some amount of experience is required to know how best to adjust the filters. Once a few trials are made, however, adjustments are much easier to make. In large listening areas, response at several microphone positions can be measured and averaged together. Response correction is not used above 1kHz for two reasons. First, objectionable low frequency standing waves occur mostly below 250Hz. Secondly, equalization for a microphone position above 1kHz is very localized. At 1.13kHz, a wavelength equals one foot. Half a wavelength is 6 inches, or approximately the distance between the ears. This means that if the response is adjusted to be flat at the microphone for this frequency, only one ear can be located at the correct spot. The other ear is 1/2 wavelength away or 180 degrees out of phase. Of course, there are multiples of this frequency and for other frequencies as well. This example is somewhat simplified, but the idea is that for short wavelengths, response cannot be smoothed at higher frequencies for both ears at the same time. The solution is to start with speakers that have a smooth high frequency response and locate the tweeters and listening position several feet away from reflecting surfaces. Measurement above 1kHz is mainly useful to establish a reference for adjusting the low frequencies to complement the highs in a smooth continuous curve. There are three suggested equalization curves depending on listener preference. They range from classical concert hall sound (C) to brighter rock music (B) and even to flat response (A). Flat response is normally not preferred. For classical recordings, the microphones are often located close to the orchestra for good signal-to-noise. However, normal high frequency attenuation due to absorption by distance, and by surfaces including the musicians and the audience, does not occur. Close recordings can then be too bright and unnatural compared to the sound at a seat out in the hall. On the other hand, for rock and new age music, there is often no reference for a live acoustical performance without amplifiers and speakers. Flatter response can be more favorable. Even classical music is now often performed with electronic enhancement and the reference of an acoustical only performance is harder to find. In the final analysis, the preference is up to the individual. Once the response is smoothed out, tone controls can be used, perhaps more effectively than ever before. They can be used to smoothly increase or decrease the relative amount of highs or lows and can give an indication for listener preference. The MQ104 cover should be reinstalled and the unit placed out of the way. A few of the MQ104 equalization corrections may benefit all listening positions and speaker locations in the room. However, if location changes are made, most of the equalization must be done over again. This includes new measurements and appropriate changes to the MQ104 frequency and amplitude settings. If the speakers are moved to a new room, equalization must be done all over again. As technology advances, real time analyzers become less expensive. Small portable analyzers like the Ivie and Audio Control make equalization much faster. These RTA's display all the bands at the same time with LED columns and class III filters. After viewing what the room can do to the response of a system, especially at low frequencies, you can see why I decided not to put a tolerance on the advertised loudspeaker system specs. I claim response from 20-20kHz but did not claim within how many dB. Even a perfect speaker with perfectly smooth response on axis in an anechoic chamber is anything but that in the far field of any room having reflecting surfaces. Of course, if the sound isn't good because of the room, the speaker always gets the blame. If a customer complained about the sound of our speakers, we were ready with our MQ104 Custom Environmental Equalizer, AA2 analyzer and CM201 microphone.